“When a true genius appears in the world, you may know him by this sign, that the dunces are all in confederacy against him.” — Jonathan Swift. You don’t have to be a genius to understand how dopamine-induced madness (DIM) turns seemingly rational humans into irrational DIMwits. And it doesn’t take a PhD to know, when it comes to DIMwits, prodigies are no better than dunces at figuring out (or understanding when it’s explained) why all the destruction we claim to disdain and complain about can be linked to dopamine-induced addictions. With the help of brain scanning equipment, researchers keep confirming there is only one addiction and it’s to the neurotransmitter dopamine. The difference between addicts is how the powerful neurotransmitter is triggered. Some use drugs, others rely on money, gambling, belief systems, and/or Abraham Maslow’s psychological deficiency needs (D-needs) for safety/power, acceptance/approval/attention, esteem/status. The symptoms for all addictions involve self-deception, denial, an inability to admit to addictive behaviors, an intransigent commitment to dopamine-triggering behaviors, indifference to the personal, societal, environmental damage the addictions cause, and flocking to groups of like-mindless addicts. This common phenomenon eludes detection because DIM reduces choices, beliefs, and behaviors down to maintaining (i.e. triggering and protecting) dopamine flow. And the biggest threat to safety, power, acceptance, approval, esteem, and dopamine flow is admitting to addictions. To protect dopamine flow we ignore, deny, get offended, offensive, defensive, argumentative, dismissive, belligerent, aggressive, and/or homicidal. History books are rife with examples of clueless rivals uniting to defeat perceptive foes. The religious and scientific DIMwits conspiring against Galileo didn’t care about justice, morality, truth, logic, science, scriptures, religion, heresies, or hell. They were colluding safety, power, acceptance, esteem addicts who joined forces to silence a tenacious adversary whose theory threatened their positions, approval, status, and dopamine flow. Centuries later, religious and scientific communities continue the time-honored, dopamine-triggering deception by pretending they’re committed to understanding dishonesty, greed, corruption, pollution, bigotry, intolerance, hypocrisy, immorality, criminality, and inhumanity while conveniently overlooking the root cause of every man-made problem — unacknowledged addictions to money, belief systems, and Maslow’s D-needs. To protect against honesty (and provide the unconsciousness addictions require) DIMwits play an assortment of dopamine games. One especially flimsy game is I’ll Let You Deny Your Addictions If You Let Me Deny Mine. ILYDYAIYLMDM is so transparent only DIMwits are fooled. But with dopamine-induced madness running amuck, there’s never a shortage of gamers. ILYDYAIYLMDM is the reason researchers aren’t employing sophisticated brain scanning equipment to investigate the links between bigotry and safety addiction, religion and acceptance addiction, status symbols and esteem addiction, and the destruction of environments, economies, lives and money addiction. DIMwit societies play ILYDYAIYLMDN by pretending cherished addictions are honorable customs. The deception is key to indulging absurd behaviors while providing undeserved credit (and triggering gratuitous dopamine) for respecting one another’s cultures. As a result, elephants are slaughtered, sharks decimated, and mine workers maimed so pathetic DIMwits can flaunt ivory, slurp soup, and flash bling. And while it would be relatively easy to expose widespread pathological selfishness, primitiveness, and neediness, confederacies of DIMwits hide behind the tradition of turning a blind eye. 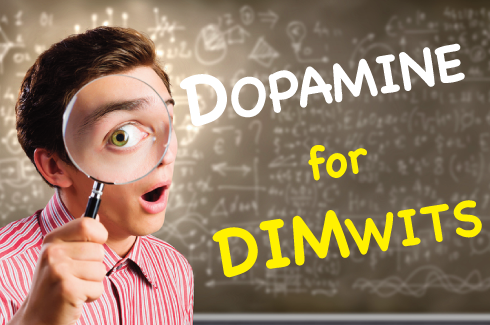 DIM makes it impossible, for geniuses and dolts alike, to consider information that threatens dopamine flow. Understanding how neurotransmitters influence/determine behavior and admitting to ignorance, mistakes, or being wrong threaten dopamine flow in a big way because they threaten safety, power, acceptance, approval, and status. To complicate matters, the mindless obsession of seeking acceptance and avoiding rejection is responsible for rampant homophily. Compounding this inability for humans to easily consider evidence they might be wrong is a principle known as “homophily.” It is often defined as “birds of a feather flock together.” Homophily is a profound and primal force in humans that binds people together in clans, tribes or groups. But it also signals to tribes who is not an insider. Those who send cues they are from an out-group are exiled and nothing they say will be accepted at face value. The brain reinforces this evolutionary pull by rewarding those accepted into a group with a bit of oxytocin, also known as the “trust hormone” first encountered in life when newborns breast feed. The belongingness urge is so powerful among humans that the threat of being ejected from a group brings on a sharp activation of the anterior cingulate cortex—the region in the brain that governs physical as well as social exclusionary pain. Homophily played a key role in evolution. Less fit primates, addicted to acceptance and approval, benefited from survival-friendly advantages that stacked the deck against fitter, smarter, independent rivals. Unfortunately, the same dopamine-induced addictions, that continue to support the survival of lower animals, were perverted into glitches that devolved potential humans into virtual DIMwits. One consequence is that visionaries and independent thinkers are routinely frustrated, thwarted, condemned, and silenced by easily-threatened, colluding, conspiring, self-righteous DIMwit gangs who get away with convincing one another they know what they’re talking about when their actions reveal they really don’t want to know. And among the many dopamine-repellent facts DIMwits don’t want to know is why, how, and that addicts flock to like-mindless groups where thinking is discouraged and disparaging, disliking, and disbelieving outsiders encouraged. It’s the 21st century and, despite overwhelming evidenced to the contrary, we continue to prefer dopamine-appealing conceits about being what we aren’t over dopamine-repellent facts that threaten to expose the pretensions. There’s no way of knowing how many countless breakthroughs were ignored, mocked, attacked, or crushed because the unknown, unconnected, underfunded, open-minded, insightful outliers advancing them proved no match against confederacies of powerful, entrenched, easily threatened, delusional, closed-minded, craven DIMwits whose only concern was maintaining dopamine flow.